A new amplification tool was released onto the unsuspecting iTunes App Store this week: Tweet Buzzword Bingo. 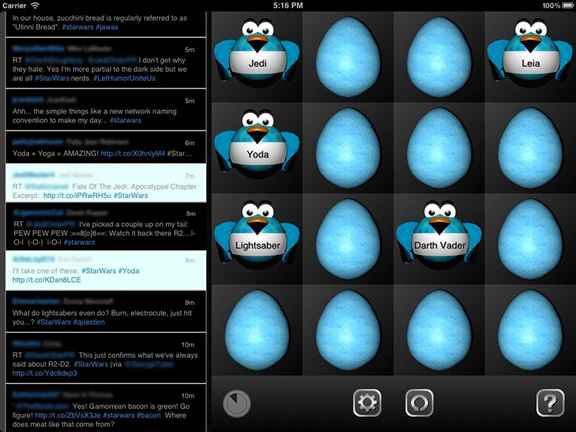 Tweet Buzzword Bingo is an iPad app allows you to play Buzzword Bingo using a Twitter hash tag. The organiser sets up the game with up to 16 buzzwords and specifies the hash tag. As the audience tweets about the event – be it a conference, workshop, seminar or informal meeting – the game searches the hash tag for the buzzwords and reveals a square each time a buzzword is tweeted. The winner is the person who tweets the most buzzwords. …designed to encourage the audience to think about and tweet about the main themes of the presentation, thereby actively engaging them not only in the online dimension to the event, but also in the presentation itself in a more practical manner. This became the guiding principle behind the iPad version of the game. By encouraging people to tweet more, you are effectively encouraging them to amplify the event to their professional and social networks, thus expanding the reach of the event. Depending how the game is framed when introduced to the players, it could help to stimulate less active Twitterers to tweet a bit more and perhaps open their eyes to the value of Twitter at events. I demonstrated a development version of the app during my presentation at Online Information 2011 last December. Whilst there were still a few bugs at that stage, the concept worked well. During the previous talk only two people out of the 30 or so in the room had tweeted, one of those being the official Twitter moderator for the session, who was commentating. After challenging the audience to a game of Tweet Buzzword Bingo, this increased to six, thus expanding the reach of my talk. There has been lots of interest in how the game might be used in a teaching context, rather than just an events context, so I am curious to see how it is applied outside our original design scenario. The process of listening to a lecture and forming a 140 character tweet to summarise a key point is one which demonstrates comprehension as well as increasing engagement, so the game could potentially have a role as an educational tool as well as an event amplification application. I’m looking forward to trying out the final release version of the app at a suitable event in the near future. However, if anyone has a go with it in the meantime, I’d love to hear how you get on! Tweet Buzzword Bingo is available for iPad via the iTunes App Store. Further information can be found on the Tweet Buzzword Bingo homepage. You can also find Tweet Buzzword Bingo on Twitter @tweetbuzzbingo.